It is an effective learning system that makes you learn step by step about creating and managing projects. Readers may have grasp for working with project 2013 on computer and on touch enabled devices. 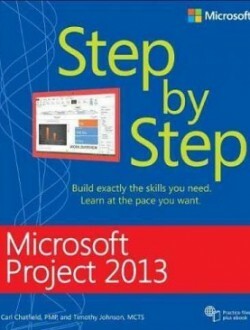 21 chapters of the book provide you detailed information about how to work with project 2013 step by step starting with the overview of the MS project and project management and further you may have dip for the concepts like guided tour of project, building a task list along with the setting and assigning resources, how to format and share your plan, tracking progress. Later chapters enlighten you about advanced task scheduling, fine tuning task, resource and assignment details, how to organize the project details, how to get your project back on track along with viewing and reporting project status. Text has been formatted with the schedule tasks. Readers can fine track cost and its progress and variances of management. You may learn about the best practices of the project management along with the customize Gantt chart views, tables and calendars. It is complete resource to enrich with knowledge of project 2013.